I was still in college when Whisper finally came into my life. I had been wanting and planning for a dog for a long time. 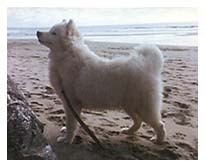 After doing a lot of research on the type of dog I wanted, I located a reputable breeder who was expecting a litter of Samoyed puppies. The first time I saw him I knew my life was about to change forever. Now, 14 years later, it's been three months since he's been gone, and I know my life will never be the same. He was 7 1/2 weeks old when I brought him home back in 1984. No longer was I a carefree college student. I was a Mom! The house and yard were puppy-proofed, and Whisp even had a play pen in the living room to call his own. 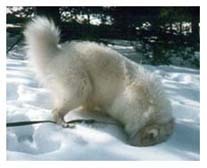 The breeder did warn me that Samoyeds are very smart, (he was potty trained in one day!) and can be very stubborn - a dangerous combination! He definitely was a challenge. It was a struggle at times to figure out who was training who! As it turns out, I think we were training each other! The first few years we were together were great, of course. 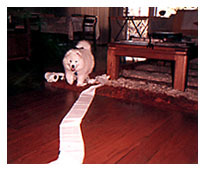 I can remember when he discovered where the toilet paper was, and how much fun it was to TP the whole house. 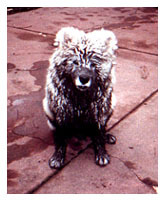 Then there was the first (and last) time he learned about mud puddles. When he was about 3 months old, he went outside in the backyard and discovered the joy of digging. I shortly came out after him, and sternly yelled "Whisper"! He turned around and came over to me, sitting down, with such a pitiful look on his face. Boy, did he ever think he was in big trouble! I told him to stay right there, and I ran inside to get my camera. I just couldn't stop laughing. How could you get angry a such a cutie! I guess he didn't think the following bath was so much fun, because he never dug again! Being such a smart pup, I quickly learned that I had to keep him busy, or he'd find something to do on his own. We took trips to the ocean. (Boy, getting sand out of his coat was a chore!) And vacations together to Lake Tahoe to play in the snow. We took all the possible training classes together, from puppy socialization through advanced obedience, and even confirmation for the show ring. Whisper did very well in dog show competitions. He won several trophies and ribbons. I, on the other hand was a real spaz! I would get so nervous, that I'd make him nervous too. So, Whisper graciously gave up his show career for me, since it was obvious that I just wasn't cut out for competition. To make amends, Whisper found his claim to fame in other ways. Twice, he was on a local San Francisco television station's promo spots, and he won third place in the nation for an Alpo photo/slogan contest. 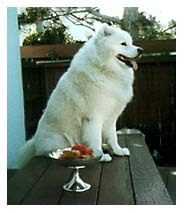 But, I think my favorite prize was his winning "Best Mutt" in San Mateo County. That prize showed, that not only was he a cutie, but he had the glowing personality to match!